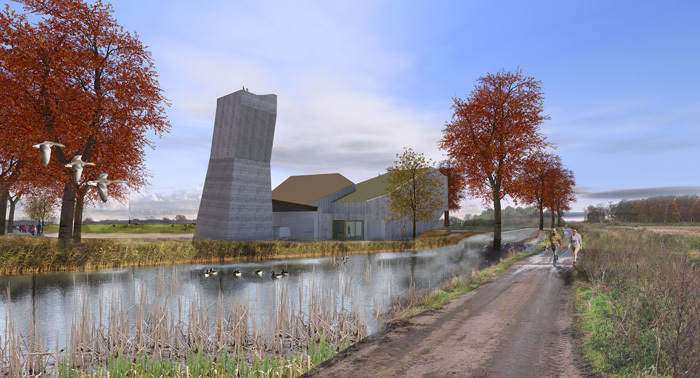 Distinct and unique, the proposal for the new visitor centre embodies Great Fen characteristics with strong visual contrasts that reflect the effects of seasonal change on the expansive landscape. The Visitor Centre will be the starting point for exploring the Great Fen, where visitors can learn about the landscape, the wildlife, and the heritage of the Great Fen, as well as enjoy great views, and first class facilities for families, schools and the community. The Great Fen is a 50-year project to create a huge wetland area. One of the largest restoration projects of its type in Europe, the landscape of the fens between Peterborough and Huntingdon is being transformed for the benefit both of wildlife and of people. More than 3,000ha of largely arable land will be transformed into a mosaic of habitat: pools, ponds and ditches; reed bed; fen, bog and marsh; wet grassland; dry grassland; woodland and scrub. 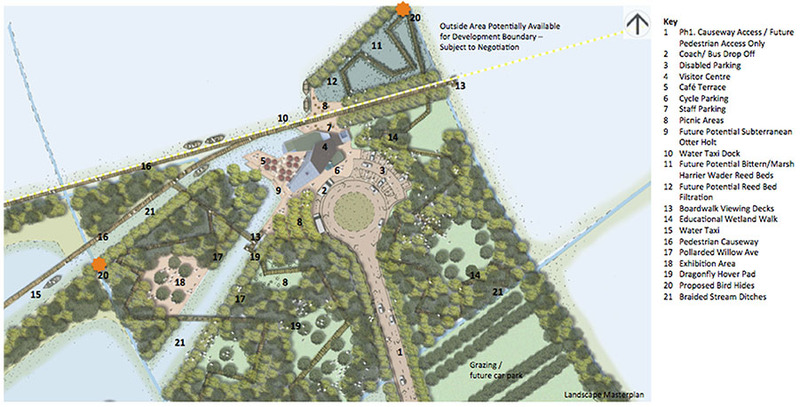 The design for the visitor centre is rooted in nature, influenced by the characteristics of key Fen species. The bold form of the building draws inspiration from the horizontal root system of reeds on or just under the surface. The building takes its volumetric form from the reed rhizome which over laps and folds over itself before pushing above ground; with key elements of the building such as the cafe and nature platform raised up. 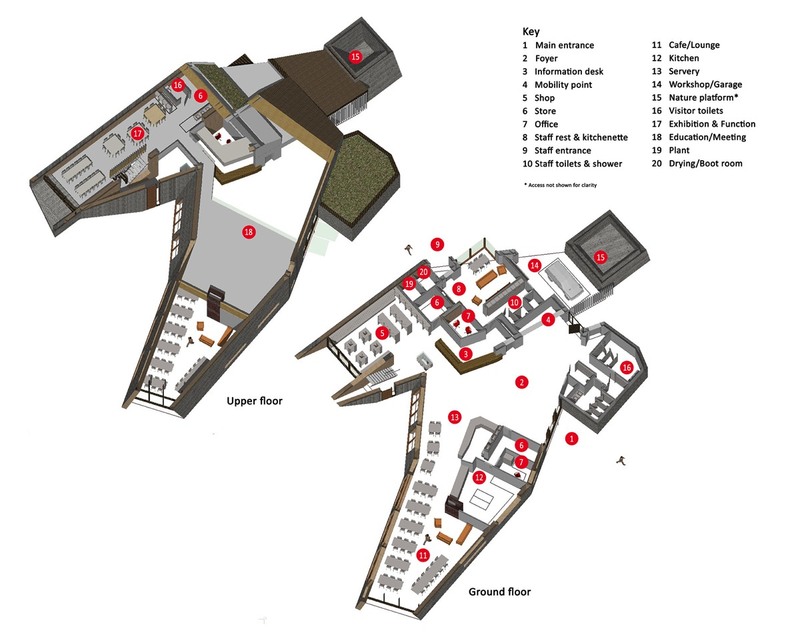 The plan is influenced by the geometric Fibonacci spiral of the alder cone graduating from a central entrance point and large open foyer space. The building’s contemporary, low carbon, low energy architecture resonates with its surroundings through its use of materials and spaces. Constructed from natural materials, modified and responsibly sourced timber, the proposed building will employ the latest timber technology to deliver an exemplar of sustainability in construction and use and be a natural companion and complement to the expansive landscape it will inhabit.